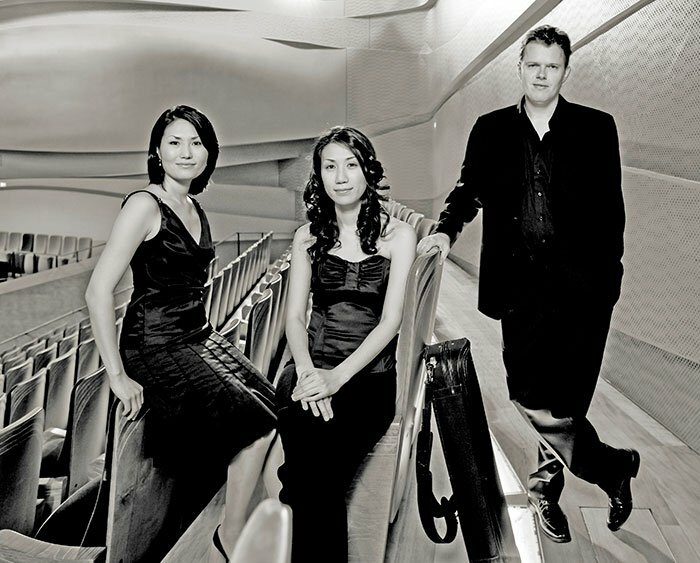 Trio con Brio Copenhagen has performed before at Maverick Concerts in Woodstock but not for several years. This ensemble’s welcome return brought an outstanding program, extremely well performed. Mozart’s Trio in E, K. 542, has the typical handicap of Mozart’s and Haydn’s trios, the subservient cello part which often makes them sound like baroque violin sonatas with continuo accompaniment. Violinist Soo-Jin Hong may have been a bit too modest in this music, and she botched a small passage in the finale. But her deferential attitude, combined with uncommonly assertive playing from cellist Soo-Kyung Hong (her sister), caused this music to balance out in an unusual and eventually satisfying way. Pianist Jens Elvekjaer, a powerhouse when he has to be, played with rococo graciousness. This wasn’t the way I am used to hearing Mozart Trios played but I think I liked it better than what I’m used to. Smetana’s Trio in G Minor, Op. 15, his only trio, requires a radically different approach, and got it. Smetana, thank goodness, is not a sentimentalist, but this work stirs up some very powerful emotions. It was inspired by the death of the composer’s young daughter, and its grief is palpable. I remember reading long ago that Liszt had said Smetana was a better pianist than he was. Although Smetana wrote some modest piano music, like his delightful polkas, piano virtuosity is a major component of this affecting music. I wish the first movement were more tightly organized, because it sounds episodic to me and that dilutes its impact a little. Not too much, though. This is music that deserves to be heard much more often. Trio con Brio changed its entire sound and attitude in this music, appropriately of course. Elvekjaer played with big sound and romantic flexibility, but never overwhelmed the powerful playing of the Hong sisters. (Incidentally, it was an added pleasure, sitting up front, to watch the way the sisters were constantly taking cues from each other.) While the Trio’s Mozart playing was classically restrained, its Smetana was romantically flexible and made use of a very wide dynamic range. I found this performance completely satisfying, a joy to hear. Even better was yet to come, though. Shostakovich’s Trio No. 2, in E Minor, Op. 67 (No. 1 is an early one-movement work, rarely played) is one of his greatest masterpieces, a immensely powerful work filled with raw emotion tempered by formal discipline. It was written in 1944, prompted by the sudden death of one of Shostakovich’s closest friends but further powered by the composer’s learning–like most of Russia–of the Nazi slaughter of Jews. There are few works of the 20th century which show such immediacy of horror and grief without going overboard. The use of a Yiddish folk tune in the finale may have been the composer’s subtle way of indicating that he knew what he was writing about. This was indeed one of the very greatest Maverick Concerts, and I felt privileged to have been there to hear it.